Cybersecurity has become a prominent issue, with hacks and breaches plaguing corporations, governments, and individuals. But instead of blaming the cyberwar divisions of nation states or sophisticated hacking rings the source of the problem might be a lot closer to home. Is anyone looking at the teens? Actually, yes. Florida is on it. Eighth-grader Domanik Green, 14, of Paul R. Smith Middle School in Holiday, Florida, was recently arrested and charged with offense against a computer system and unauthorized access (which is a felony charge). He was released from Land O’Lakes Detention Center on Wednesday. The Tampa Bay Times reports that the Pasco County sheriff’s department took action after Green used a teacher’s administrative password to log onto a school computer. While accessing the machine, he changed its desktop background to an image of two men kissing. The computer had state standardized testing questions on it, though they were encrypted and police say that Green didn’t access them. “I logged into a teacher’s computer who I didn’t like and tried putting inappropriate pictures onto his computer to annoy him,” Green told the Times. Sheriff Chris Nocco said, “Even though some might say this is just a teenage prank, who knows what this teenager might have done.” Crazy teens. Green says that his peers frequently use the admin password to video chat or screenshare on school computers. The code is easy to remember because it’s just a last name. Green discovered it by watching a teacher type it in. Months before his arrest, Green had been suspended for three days for using the admin password to access servers. 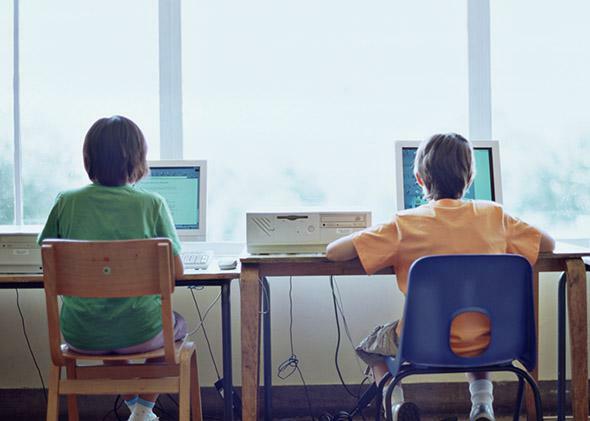 But logging onto a computer that contained information related to state-wide standardized testing was more serious. * Pasco County School District says it is now overhauling its password system. Correction, April 15, 2015: This post originally misstated that Domanik Green was suspended from school for three days immediately before his arrest. His three-day suspension actually occurred months before.